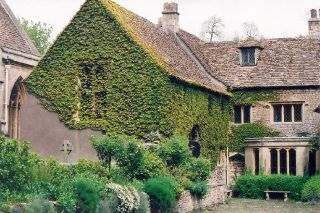 Horton Court is a lovely manor house set deep in the Cotswold countryside. The Court features a detached ambulatory from a 12th century rectory, and a nearby Norman hall with early Renaissance decorative carving. It is quite possible that Horton Court rectory was the first on England. The north wing of the manor dates to around 1140, though it was remodelled several times in the medieval period and again in the 18th century. The main part of the manor house was built around 1521. What makes Horton Court so inriguing is that it represents one of the very few examples of an unfortified Norman domestic building in the country. Normally, the Normans built with defense firmly in mind, so domestic buildings were well fortified and might better resemble a castle than a house. Horton Court, on the other hand, seems to have escaped this approach entirely. The manor was rebuilt in 1521 by William Knight, a prebendary of Salisbury. In the early 18th century an upper floor was added over the Norman hall, joining the hall and the house, and creating a Catholic chapel. Note: The manor house is privately owned and not open to the public. The rectory and hall are well worth a trip, though! Location: Located on minor roads 3 miles north east of Chipping Sodbury.